1. Shred and pick your rotisserie chicken and set aside. Place all bones, celery, carrots, and water in a very large stock pot. Add some salt, bring to a boil, cover, and bring down to a low simmer. I generally let this simmer a couple hours. 2. Slice your sausage and brown in a cast iron skillet or large pan. Set aside. 3. Strain out the bones and vegetables from your stock, keeping it simmering at a low heat while you make your roux. 5. Slowly incorporate your roux into your simmering stock. Add in large spoonfuls at a time, making sure it is fully incorporated into the stock before continuing - you don't want big clumps of roux floating around. The gluten free flour in the roux can sometimes take a little extra effort to incorporate. Using a whisk helps. 6. Add in your chicken and sausage to the roux/stock. Add in spices and bay leaf and allow to simmer for at least an hour, stirring occasionally. 7. Serve over white rice with some Crystal hot sauce! New Orleanians take their gumbo very seriously. 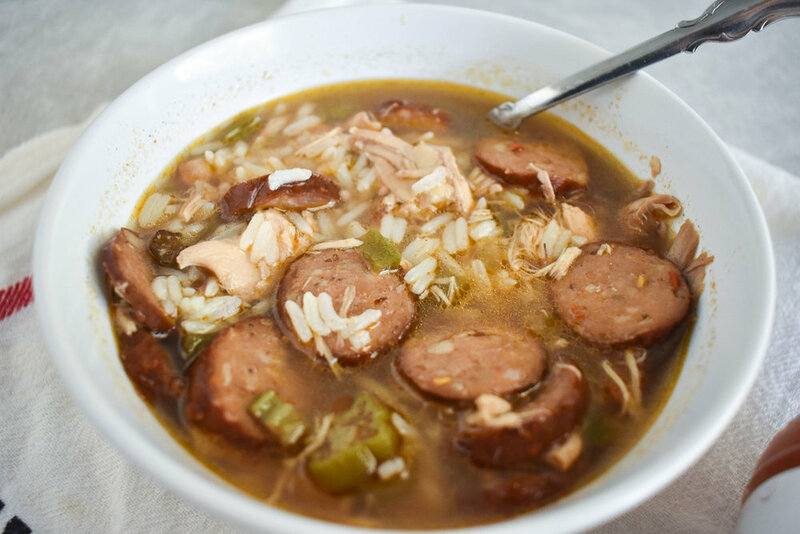 I was devastated when I thought I couldn't eat gumbo (or so many other NOLA foods) anymore. I tried to make a gluten free roux once, and failed miserably. But I didn't give up! I was not going to just no longer be able to enjoy my favorite cold weather food on earth. Low and behold, this recipe! It is seriously as good as the real deal, with no stomach ache inducing foods.